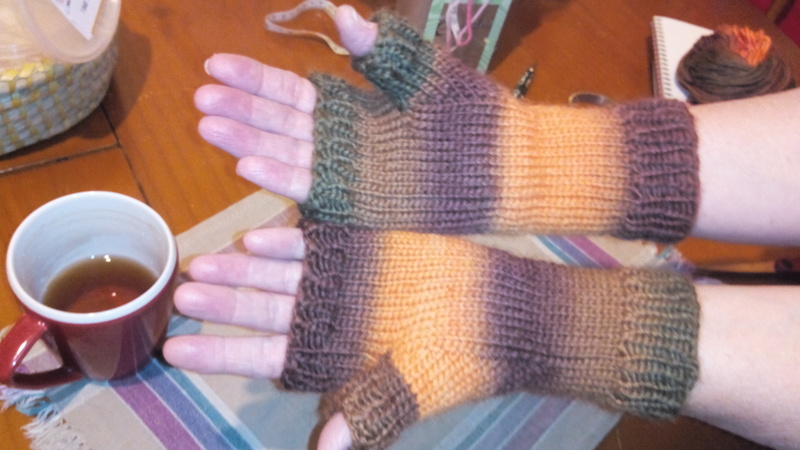 Eldest Niece’s mitts have finally left my hands and I hope they’ll soon be keeping hers warm. Meanwhile, I’m about four stitches away from completion of unpicking the sticky beanie (knitted using Moda Vera Bouvardia yarn) and hope to be back on the knitting of it by tonight (the four stitches are where I’ve woven in the ends, so I’m finding them particularly tricky). I won’t complete it tonight but it will only take a couple of evenings of work (it’s knitted in the round so there’s no seaming to contend with) to have it where it needs to be: ready for popping in the post to the friend whose head it’s intended to cover. Then, and I’ve promised myself it will be only then, I can make a start on some socks for Dr B. To put that into context for you, they’re Italian knitting terms: diritto means knit, rovescio means purl (and knitting is lavorare a maglia as opposed to crochet, which is done with an uncinetto and is also called uncinetto). Rovescio also has that other connotation or overtone of “reverse”. Although I’ve been knitting my most recent beanie in the round and therefore there’s only been a bit of rovescio at the start to do the ribbing, I’ve certainly been reversing a fair amount of it while helping out with the Italian emails. My pile of kinked yarn is growing as I steadily tink back to the point where I goofed with the shaping. You wouldn’t think it would take so long – and if I’d simply yanked the needles out and pulled, it probably wouldn’t – but this yarn (I’m once again using Moda Vera Bouvardia, which has some unexpected but attractive colourways and always knits up to a soft, warm finish) is slightly sticky and I’ve found in the past that it’s better served by being taken apart stitch by stitch, however painful. That’s what I’ve been doing, round by careful round and doing my best not to poke anyone in the eye as I wave my spare set member about (that would be a DPN, by the way, for anyone who prefers that terminology). Also, we’ve been doing a lot of Italian here lately (spot the Italian dictionary in the photo). All three of us spent a whole day curled up in bed – because Dr B had bunged up his knee and couldn’t walk; but there was work to be done! – writing a fairly simple email to the Italian academic liaison officer who’s YoungB’s contact person at Bologna. There is nothing simple about an email that needs to clarify many of the subtle points arising from the very different academic systems. However, with all of us on the job, me on coffee brigade, YoungB occasionally calling it quits to go stretch his legs and Dr B keeping us focused on the job and acting as our (Italian) thesaurus, we did it. Trouble is, as YoungB says, we’ve set the bar too high. His [written in the email] Italian sounds so good that they probably think he’s practically dreaming in it. Uuh, not quite. However, by the end of the day – you might call it a crash course in bureaucratese immersion – he was certainly much better able to come up with his own alternative modes of expression. After a few heart-stopping moments early in the day, when it seemed as if nothing we’d said previously was going to carry any weight short of taking our case to a Very Big Wig (and that’s something you want to avoid at all costs, Italian bureaucracy being what it is), we managed to convince the folk in Italy that, well, all things considered, this kid is practically a genius! No, he’s not. He’s bright enough but intellectually lazy – one of his Year 12 teachers advised him that he wouldn’t be able to get by on good looks and charm for much longer, at which we laughed uproariously (hardly the ideal parental response) – but even so, the biggest hurdle wasn’t whether or not he was up to the subject choices, disparate though they appeared at first glance, more that the Italian system doesn’t seem to have much space for combined degree patterns though there’s enormous flexibility within degrees. In the end that might amount to the same thing. Be that as it may, YoungB is enrolled in a Bachelor of Arts/Bachelor of Science combined degree. It’s not that uncommon here though there are other degree programs with higher enrolment numbers (anything with Law and Economics, for example, and the Bachelor of Arts/Bachelor of Music is likewise popular; in that case largely, I suspect, because it allows music students to have better employment options at the end of it all). Because YoungB likes humanities subjects and science subjects and he had – indeed, still has – no idea of what he wants to do when he finishes his undergraduate studies, the double degree sounded like the best of both worlds and a good basis for whatever he might decide to take to higher study. Nobody said it was going to be easy, and it hasn’t been, but he’s passing his exams and enjoying himself. That’s reward enough for his efforts, we think. While it might be the case that there are Italian universities where such weirdness exists happily, Bologna doesn’t seem to have that crossover readily available, hence the root cause of much of our recent anxiety. Once we’d curled up and nutted out a detailed but not overdone explanation of what YoungB’s subjects hitherto had involved and further explained why he’d chosen first-year subjects at 75% load – his poor Italian skills being a big part of all that, as he pointed out at different parts of the email – the very prompt response was, “OK, you’re good to go with what you’ve chosen,” or words to that effect. There was a further comment in the email that it’s unusual to be doing such unrelated areas of study concurrently, hence our feeling that combined degrees in such diverse disciplines are either rare or non-existent in the Italian tertiary sector. Never mind. We got the green light so whichever way you look at it, that was a very good use of our day. I’m not quite back to going forward with my knitting, but there’s probably only another round to tink before I’ll once again be roaring full steam ahead with diminishing the number of stitches. My friend whose head this beanie is intended to cover is already in dire need of it – he lives in Tasmania, where the mornings are cold – so, along with the urgency of needing to explain newfangled Aussie degrees and degree patterns to an Italian at Europe’s oldest university, there’s the urgency of a bald head that needs a warm hat. It’s now going to be diritto all the way and no rovescio at all if I can help it. Would you reckon that’s going to work or will there be another slew of unpredictable reverses to push it all onto the back burner? Only time will tell. Well, it’s greeny-purpley and it sort of matches my raincoat. As for the windblown and half-frozen look? it’s a step up from how desperate things looked with the beanie included! I’m so worn out by the ramifications of technology failing that I lack the imagination to think of a clever title for an obvious post: I’ve finished the greeny-purpley latticework scarf I’ve had as one of my portable/transportable knitting projects. I’d originally intended to make it longer but faced with the prospect of a few days in Ballarat with NO WOOLLY SCARF, I decided that, really, if I stopped pretty much where I was, then I wouldn’t have to join in another ball of yarn, which would mean fewer ends to sew in. With time pressing, that idea was a clear winner. Therefore, that’s precisely what I did: finished it forthwith late on Monday night. But, oh dear, here’s my heinous admission, I didn’t block it. I really did not have time for that. Of course blocking makes things softer and you can get your latticework looking much prettier, but on a cold night, can you guarantee that the scarf will dry in the three or four hours left before you need it? I was certain I could guarantee it would NOT dry, so I left it unblocked. That’s how it went round my neck early on Tuesday morning and it stayed there fairly solidly until Friday afternoon when I came home again. I might have been in Ballarat to cheer at rowing competitions – as, indeed, I was – but the weather had other ideas. YoungB and I spent an enjoyable afternoon pottering about doing some touristy stuff instead. We visited Sovereign Hill on a very cold, wet, windy afternoon. There we got something of a taste of how tough and appallingly miserable life must have been for our ancestors (none of mine that I know of was ever in the Victorian goldfields and certainly none of Dr B’s; but I’m sure you take my point). YoungB and I decided that, although we’d never have survived, we were grateful that our forbears had obviously been made of sterner stuff. My scarf did sterling work. It had hot chocolate spilt on it and goodness knows what else blown onto it by the wind or washed onto it by the rain and the spray from Lake Wendouree, where some rowing did eventually take place, but through all of that it kept me warm. Mostly, that’s all that I require of a winter scarf. If it’s pretty as well, that’s a bonus. I think this one is and I certainly love the colour (why, it even almost matches my very old raincoat). I took a beanie with me but was wishing I’d been more sensible and taken my balaclava. Yeah, I know, a balaclava is not a good look even for those intent on unlawfully relieving banks of whatever they have in their vaults but I don’t think I would have cared how silly it looked; at least I would have had full-face protection. As it was, the beanie protected the top of my head and the tops of my ears, and you’d probably agree they’re important considerations; but my face? My poor, sore, windburnt and frozen face? No. That would have required my left-at-home – because I didn’t want to embarrass YoungB more than necessary – balaclava. When I mentioned this to him, he said he wouldn’t have minded had I brought it because, when it’s that cold, you don’t care what you look like as long as you’re warm. I’ve been saying that for years, so I couldn’t disagree. Pattern: A simple, four-row, latticework pattern bordered by garter stitch, somewhat similar to a scarf I had when I was a teenager. It’s not truly reversible, but either side looks okay. I used a crocheted cast-on and slipped alternate-row edge stitches to keep things tidy. Because of swapping from project to project, I missed a couple of slips, I think; but if anyone is close enough to notice, then the likelihood is that they’re not looking at my scarf. Yarn: two skeins of Moda Vera Bouvardia (a 70% acrylic, 30% wool mix that’s self-striping) in green (colour 104-06, dye lot 4), held with one skein of Moda Vera Giselle in dark green (colour 03, dye lot 1109492). The Giselle is a 70% metallic, 30% wool mix that gives the scarf a bit of sparkle but whose darker hue means the overall tone is less strident (in other words, more boring but totally unobjectionable for work purposes). I had a small amount of each yarn left over. Needles: 6 mm (UK 4/US 10). Dimensions of finished article: about 9″ wide by 5’6″ long unblocked. Since washing, it’s softened and lost some of its bulkiness but I decided not to block it much longer, even though the latticework would allow it to be lengthened considerably, so those are probably close to the dimensions it will retain. It’s presently about 8″ by 5’8″. Would I knit it again? Yes, possibly, although it wasn’t quite such good take-with-me knitting as I’d first thought, and I spent a fair bit of time tinking part-rows because I’d headed off in the wrong direction with a pattern row, or forgotten a pattern row altogether. That was largely a result of being distracted by conversation but you don’t want to be getting huffy with your knitting when you’re pretending to be cool and calm and watching the rowing time trials, do you? So that’s my latest FO and my latest confession. But what would you have done in such dire need at the eleventh hour? Would you have blocked your scarf? If so, I tips me lid. I suppose I’m just not that dedicated; or maybe I was more concerned about being warm! Have you ever had unexpected results when knitting? Sometimes a yarn that looks pretty knits up to something quite ho-hum. I’ve had that experience recently with Lincraft Big Wool, a soft, fifty-fifty wool and acrylic yarn. It’s a thick/thin yarn described as roving style and I bought dye lot 18308, a denim mix. It knitted up in blobs of colour and texture that looked clumsy; and it didn’t matter how I tried, that flat seam was never going to be invisible. The hat is OK – it even looks all right on Dr B; and YoungB rightly said it’s nice and warm – but perhaps not for gifting to anyone. Dang. There went that bit of birthday knitting! Quite an obliging hat model, don’t you think! However, colour and texture in the hat itself are best described as lumpy. And then sometimes, a yarn that looks all right if not spectacular knits up to something impressive. I have what is probably a love-hate relationship with Moda Vera Bouvardia yarn. It’s soft and there’s a lovely range of colours but most of them also have bits of utterly unrelated and not flattering colour within the skein and in the past, I’ve found the skeins to have significant amounts of knots. I think you’d agree, that’s frustrating at best, particularly if you don’t notice the knot till you’re halfway through a long row. This one proved a lovely exception. There were no knots and it has knitted up to an overall look that’s dark but not dull. The resulting hat/beanie is so nice I almost don’t want to give it away to anyone! Soft yarn, smooth texture and a pretty colour mix. Nice hat! These are a couple of my recent concurrent-with-mitts projects that I can knit at the table, listening to vigorous discussion as to what movie we might watch, and not fear I’ll make a mistake. The first is made using my Villawool Inca hat pattern, the second pretty much of my own reckoning with some assistance from the Yarn Harlot’s Knitting Rules as to decreasing. You need plain projects but the results don’t have to be plain. Pink is a colour my cousin wears often. And, OK, the cowl is a shade different from the instructions. I used a crocheted cast-on so that it could be worn either way with impunity. I managed the slipped stitches by knitting in situ then passing over the previous slipped stitches, rather than following the instruction of moving then knitting. If there’s a difference in outcome, it’s slight. I worked more repeats of the pattern (10 in all). I had a few arguments with the yarn (it had knots in it and there was so much muddy brown that I ended up chopping out a significant amount to ensure finishing with a pink edge) but it knitted up nicely, the garment is soft and our weather presently so hot that it dried almost before I put it out under the umbrella to block. And is it true to name with just a few extra hours to account for extra repeats? Not for me. I’m a slow knitter. All the same, it took about two days so that’s not bad. Today my cousin was discharged home for a couple of days while treatment plans are discussed, so she won’t need this right now. But she’s bound to need it when she’s readmitted next week. How’s your knitting coming along? I hope you’ve all enjoyed your Christmas celebrations, whatever form they took. An FO? Yes, just one: the White Caps Cowl, which I was knitting till almost 9 o’clock on Boxing Day morning (luckily for me, it wasn’t needed until lunchtime; but, yes, it was somewhat necessarily, therefore, gifted unblocked). Sewing? A few lavender bags. Other knitting? None. Surviving the end-of-year busy-ness was sufficient achievement. And, as I’ve yet to send cards, I’m not too sure if we have survived. I’m going to call them New Year cards, though. But, you know, we made it through a festival of feasts and visits by friends and family, a birthday, a wedding anniversary, exam results, exploding champagne, a concert or two and lots of everyday stuff that included inordinate amounts of time dedicated to fitness pursuits (no, not me; that was everyone else while I was playing laundry lady). What can I say about the White Caps Cowl? I adapted it slightly in terms of number of repeats. I think it’s probably a make that would knit to a nicer finish in its recommended yarn but I’m quite taken by the weight of the Patons Sorrento, the hint of glamour it provides with the slightly shimmering aspect of its mixed fibre and the smooth contrast of the Cleckheaton Bamboo. As far as knitting went, the bamboo was much easier on the hands and I was able to make reasonable progress. The variable thickness of the Sorrento slowed me down quite a lot. It hasn’t put me off by any means, as I’ve stocked up my cupboard with enough yarn to make a couple more of the White Caps Cowls throughout the year (it really is good on-the-bus knitting and I love the look of it). I might not use a faux seam with another make; it doesn’t really ring my bells. The photo was taken hurriedly with my phone, prior to wrapping; excuse background (bedcover) and less than ideal lighting. One of our visiting friends has put in a couple of knitting requests and I’ll be happy to oblige her with a Villawool Inca L574 hat in a colour scheme to her liking (that will be a reasonably fast knit, even at my pace). I’ve yet to decide on the yarn for that (the Villawool Inca being no longer available) but am fairly sure I could manage it from stash, which you’d have to consider a win. Hardly surprisingly, the really thick winter yarns are somewhat thin on the shelves at this time of year. There will also be a three-colour linen stitch scarf though I have absolutely no intention of making it as long as its predecessor. I understand about long scarves and cold climes, truly I do; but there is a point beyond which the extra length simply gets in the way. I bought yarn for that yesterday at Spotlight. I would like to make one for myself but will wait and see how other things pan out before I make that a firm promise/plan. I started something akin to a prayer shawl – perhaps a care shawl – for a colleague who has had a rotten year by anyone’s standards. I won’t finish it quickly (the needle size is just on the edge of my comfort zone and I struggle to find a rhythm even with the very easy pattern) but it might be ready for her April birthday. In any case, she’s not expecting it so in some respects I have as much leeway as I need on that one. The yarn bombing coordinator rang the other day to ask for more contributions: red hearts and lots of roses, not necessarily red, for another yarn bombing project, the previous one in Victoria Square having been hailed as such a success. I’ve already crocheted up a few test roses which will be perfectly acceptable contributions and am looking around for a heart pattern that looks sufficiently heart-like and sufficiently large. I think this one fits the bill. I know where the drop-off point is and I have my dark glasses at the ready so I can ensure my hearts and flowers are there before the due date. You might not be surprised to hear that Dr B and YoungB have somewhat taken this yarn bombing idea and run with it, referring to secret language, pack leaders and cell members as if it were an underground movement. I humour them. At least they’re not objecting! In sewing news, I’ve repaired YoungB’s Draggins (kevlar-reinforced motorcycling jeans) again, having previously taken up the hem by the amount he requested. Anyone who knows about jeans will understand that much use had seen them sag to a point where the hems were in shreds. This time I cut off the original and new hems and turned them up twice. They might look a shade short were he to wear them with loafers but as that’s unlikely – his motorcycling gear has been carefully chosen to enable him to wear it all day, boots included (though I’d accept that leathers in winter are for on the bike and not much else) – then we reckon that this time they won’t catch on his boots nor drag on the ground. That’s not the sort of drag the brand intends although I’ll be very happy if it’s the only sort this pair of jeans ever encounters. I still haven’t managed to make a new top for myself or tinkered with my rescued skirt and stripey trousers to create the jacket I’d half-imagined could be made from them, using Portia’s kimono-tee pattern as inspiration (it’s a winner; I’ve already used it to make five tops of varying degrees of respectability). They will happen at some point, I suppose. However, I have received my Pattern Pyramid winnings from Meg and will undoubtedly have something to show you from that; but not just yet. So if you’ve been eagerly awaiting the announcement, take this as advance warning. I’m still rather run off my feet and although – o frabjous day! – I have managed to clear the sewing table (nearly, anyway), I have a couple of other urgent tasks that simply have to be done before I can allow myself to be frivolous. All in all, I think 2013 is going to be just like 2012: full of good intentions, lots of things made that I didn’t really intend to make, other people’s things coming ahead of mine on a regular basis and anything made for myself done terribly last-minute and not terribly well! I do hope that you have a better year in terms of your crafty endeavours, whatever form they take. Cheers, everyone, and happy new year.